Be sure to read the thread for updated information for Saturday! This location is a short drive from Kansas City and Mid-Missouri, however we encourage all MINI’s through out the state to make the trip to Richmond for this MINI Rally. 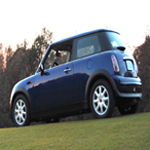 WHY: This will be the SIXTH year that there will be a MINI Cooper Rally at the Richmond Mushroom Festival. In 2017, NINETEEN MINI’s attended and we all enjoyed the parade and diversity of the Mushroom Festival. There were many unique vendors and a wide array of food stands. The people of Richmond really enjoy seeing the MINI Coopers at the festival and in the parade last year and wanted us to come back this year. DETAILS: The Mushroom Festival is an annual event that attracts a lot of people and they start on Thursday evening and conclude on Sunday. They have provided us an area to display our MINI’s next to the vendors. There is no cost, just a great time for fellowship, to display our MINI’s and participate in their Mushroom Festival parade. MINI PASSION: Hilary Morrissey is a passionate MINI owner. She has attended MINI Cooper shows and events throughout the state as well as hosting the MINI’s to Macon show in October 2011 & 2013, the MINI’s to Richmond show for the last 5 years plus the MINI’s to the Springs Rally in Excelsior Springs, MO in 2016. The opportunity to get a group of MINI’s together at a fun event seems very appealing, so here we go! Mark Saturday, May 5th, 2018 on your calendar and make the trip to Richmond, Missouri! TO MAKE RESERVATIONS TO ATTEND: Please e-mail Hilary Morrissey at ministomacon@gmail.com with your first and last name, the year, model, and color of your MINI. Hope to see you at the Mushroom Festival in Richmond, MO! MINI Owners that are attending! 4. Wes & Deb H.
5. Larry & Linda P.
8. Jason & LeighAnne J. Last edited by ragtopday Johnna on Wed May 16, 2018 2:19 pm, edited 7 times in total. It's official! We would like to invite you to attend the MINI’s to Richmond, MO Rally/Show! The date is Saturday May 5th, 2018! For some of you we have shared this experience in the past and have enjoyed the friendship and camaraderie. For those who have not been to the Mushroom Festival, it could be an adventure well worth your time. If you have the passion of the MINI, you know it is exciting to see new models of MINI’s, hear stories of trips, learn special detailing tricks and understand what makes the MINI so unique. MINI’s are not for everyone, just the few that have a special flare. Come join us in Richmond, Missouri for an event that the City of Richmond looks forward to the yearly migration of the MINI’s to the Mushroom Festival. Hope to see you in Richmond, MO on Saturday, May 5th, 2018! We are half way there and hoping to get 10 more MINI commitments for the Mushroom Festival. Right now the weather is not too appealing and Spring seems far away. We are hopeful that Saturday, May 5th will be Sunny and 75 degrees! That would be a great forecast for a fun day and an opportunity to share some MINI fellowship. I realize we are still a month away, however I want to keep this event fresh in everyones mind. I hope you can make plans to come to Richmond, MO for the Mushroom Festival and let all of the Richmond citizens delight in our vehicles of pleasure. GO MINI! Hope your calendar allows you to attend the rally on Saturday, May 5th, 2018. Visit the website www.ministorichmondmo.moonfruit.com for more details. Hubby and I are going. I just got interviewed by the Richmond Daily Newspaper this morning and they are running an news article about the MINI Coopers coming to Richmond, Missouri. If you are interested in attending, please email me at ministomacon@gmail.com with your name and car information! Be sure to check out the website for more details about the event! I love this event, Deb and I are excited to be able to make it again this year. Due to things just not going as planned around our house, we are not going to be able to make it. Don't forget to post on Facebook a reminder of this. Also, is anybody meeting up to drive up to Richmond? Minidrama wrote: Don't forget to post on Facebook a reminder of this. Also, is anybody meeting up to drive up to Richmond? I think we usually do a roundup at the Casino and head out from there. If you want me to, I can lead that contingent. I have a yellow hazard strobe for the roof. They’ll see us coming. 5 days until the MINI’s to Richmond, MO Car Rally/Show! The weather forecast is Sunny and 75 degrees. It should be a great day to kick off a fun summer. We have about 10-12 MINI’s now and are anticipating several drive-in’s. We have plenty of room so if you get the itch for a little MINI adventure. Come join us Saturday morning! Don't forget about the parade! You might want to bring a kit to get your MINI/Mini all shiny before hand. Please also note that you can bring candy to give out during the parade but you CAN NOT throw it from the car. You must have a walker that hands it out. Don’t forget to bring your lawnchairs, cooler with drinks/snacks, cash. name and car information so I can get an accurate number to make sure we have enough space for our amazing MINI’s. If you decide last minute to come to the rally….just come on over! Hope to see you and your MINI Cooper there in Richmond, Missouri on Saturday, May 5th, 2018. Everyone who is going to the Mushroom Festival. I am leading a caravan Saturday morning from the Ameristar Casino parking lot. The plan is to meet at 8:45am and depart the parking lot for Richmond at 9:00am with an arrival time in Richmond of 9:30am. No need to RSVP. Just meet in the parking lot at 8:45. I will be here slightly earlier. Look for the blue Clubman with the yellow flashing caution strobe on the roof. Don’t forget two way radios if you have them.